Open the dough on a well-oiled baking dish, stretching with your hands, and making plenty of dimples all over its surface. Add a good coating of olive and avocado oil, mixed about 50:50. 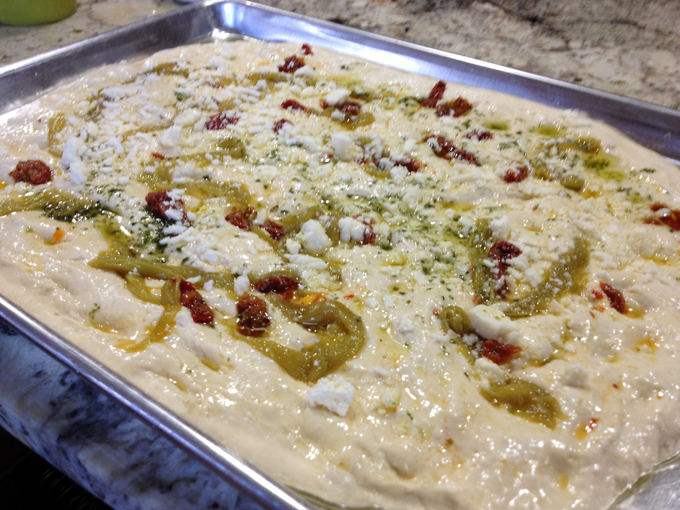 Distribute the slices of chile, cheese, and sun-dried tomatoes all over the dough. Season with salt and pepper. Bake as directed in the original foccacia post. For the chiles, I used the brand featured in this post, a gift from our friends V & K. They have amazing flavor, and of course go very well with Cotija cheese, one of those matches made in heaven. 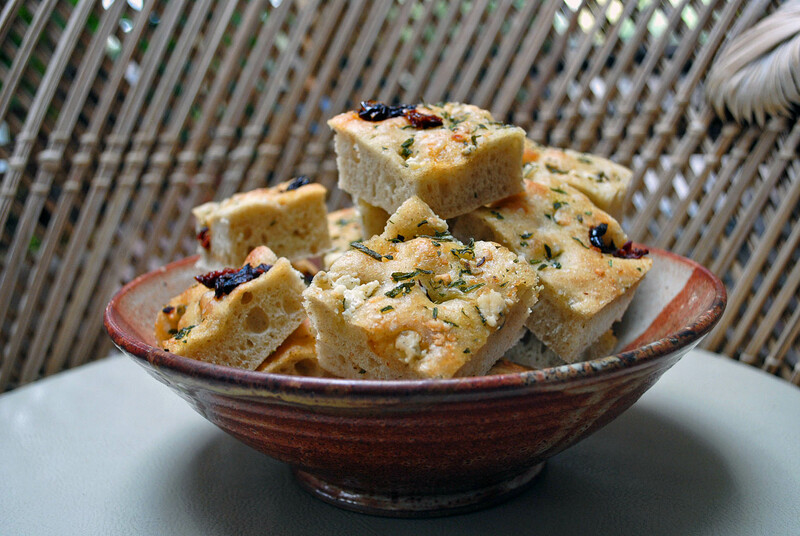 Like V & K.
The focaccia squares freeze well, I like to wrap 3 to 4 squares in small packages and enjoy them for weeks. Simply remove from the freezer 30 minutes before your meal, and heat them in a low oven until warm and fragrant. Last month I posted a few of the culinary projects I had in mind for the near and not so near future. 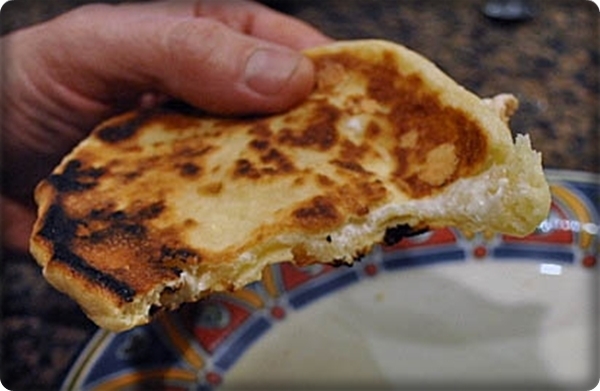 The first one I tackled was Codruta’s flatbreads, made with a sourdough base, and filled with cheese. One bite is all it takes to fall in love with them. Thirty years went by. The boy is now a grownup man, and his girlfriend a gorgeous woman, whose passion for cooking lead her to try and recreate the flatbread of her partner’s childhood. And I am lucky enough to take a ride on their journey, and sample the delicious cheesy bread that warmed a little boy’s heart and soul. Dissolve the sourdough starter in the water, mixing gently. Add the yoghurt and beat well, then whisk the eggs in the mixture. Add the flour, stir, and let the dough sit for 20 minutes at room temperature. Add salt and knead with an electric mixer until the gluten starts to develop (about 6 minutes). If the dough seems to soft, add a tablespoon of flour. Add the oil in small amounts, continuing to mix, until the dough absorbs all the oil. At this point, the gluten must be very well developed, and the dough quite elastic and smooth. This amount of dough is enough for 12 to 15 flatbreads. If you want to make fewer, simply store in the refrigerator the dough not used. Next day it will have even better flavor. Place the dough you want to use on the same day it is made in a warm place and let it rise for 4 to 5 hours. Pick the fillings of your choice: crumbled sheep’s cheese with herbs, or sautéed cabbage, or go for a sweet version using grated apples and cinnamon sugar. 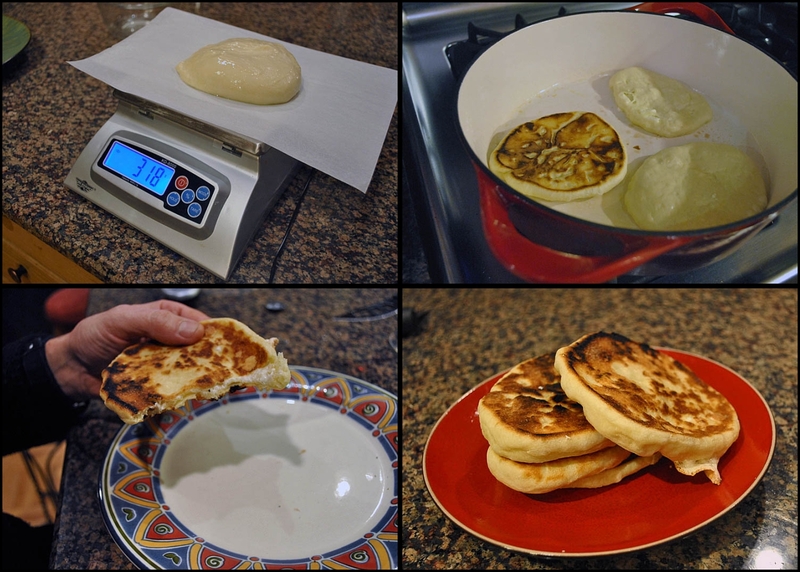 When you want to make the flatbreads, tear pieces of 45-50 g of dough and stretch over a surface lightly coated with oil (a smooth plate works great, or a granite countertop) until it forms a circle about 15 cm (6 inches) in diameter. Place the filling in the center, and fold all edges over the filling, sealing well and making sure no big air bubbles are trapped inside. Carefully roll the circle as thin as you are able to, without tearing the surface. You can try and make it around 20-22 cm (8 inches) in diameter, but it takes a bit of practice. 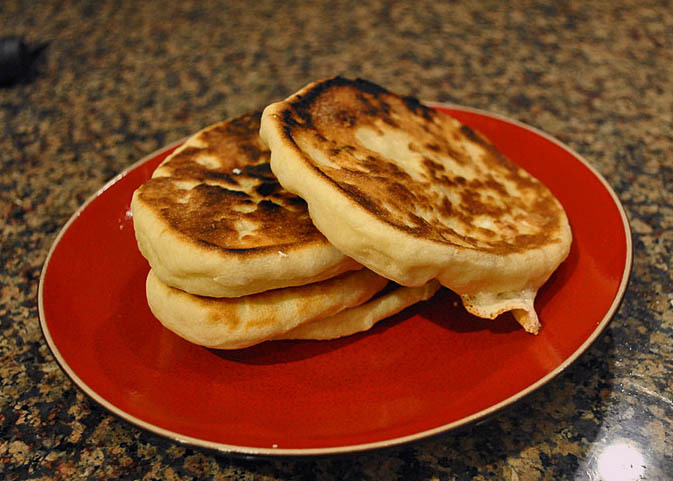 As you roll each one, place it on a skillet coated with a light spray of oil (well seasoned cast iron, or non-stick), and fry each flatbread until nicely browned on both sides. Transfer it to a plate and proceed to cook the next one. Or, if you roll them a little smaller, fry as many as you can fit in your pan, but don’t allow them to touch. Comments: When Phil took the first bite of the bread, he immediately remembered the cheese breads from Brazil, and the feeling he had the first time he had one: pure bliss! 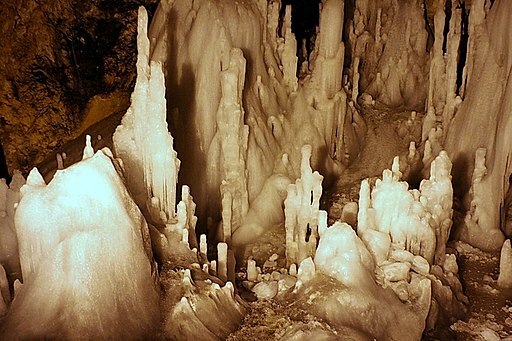 We can testify that you won’t need to be lost in a forest to appreciate these babies, they are awesome! Next time I want to make these flatbreads filled with sauteed shredded cabbage, as Codruta told me it’s one of her favorite flavors. But, the possibilities are endless, you can even make them without any filling, and just sprinkle some spices on the dough before enclosing and stretching. A great use for your sourdough starter! I used my basic “No Need to Knead” recipe as the starting point for this version, that includes a small amount of rye flour in the dough. Rye gives it a more “rustic” feel, and the sun dried tomatoes a hint of sweetness to balance the sharpness of the gorgonzola cheese. 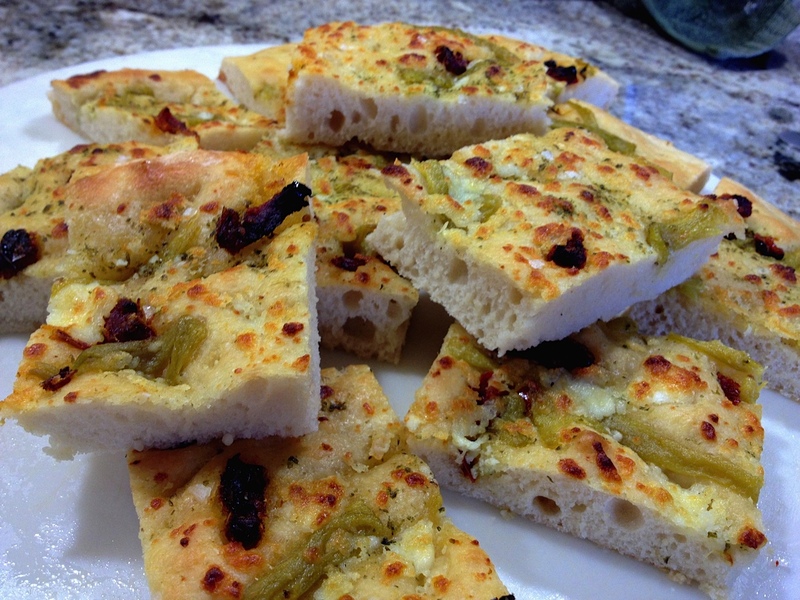 This colorful focaccia will be a great addition to your end of the year festivities, and it is so simple to prepare, you can pull it even in the middle of an intense cooking marathon. Measure the water in the bowl of a KitchenAid mixer, sprinkle yeast over the water and stir until dissolved. Add the two types of flour, and the 3 teaspoons of salt. Mix for a minute or so, until ingredients form a shaggy mass. Let the dough rest for 15 minutes. Using the kneading pad, knead the dough for about 8 minutes, until smooth. It should still cling to the sides and the bottom of the bowl. Cover the bowl with plastic wrap and let it rise in a warm place until almost doubled in volume (1 to 1.5 hours). Meanwhile, cut the sun dried tomatoes in small pieces, and crumble the gorgonzola cheese. Reserve. Heat the oven to 500F. Oil one (or two) non-stick 13×18 inch baking sheets (I prefer to use a single one, to get a thicker focaccia). Pour the dough onto the sheet, brush the surface with 1 Tbs olive oil. Dip your fingers in cold water or olive oil and make indentations all over the dough, working to stretch the dough as you go. Distribute the sun dried tomato and gorgonzola cheese all over, pushing them into the dough, using a little more olive oil, if necessary. Sprinkle rosemary leaves all over, a little salt (careful, gorgonzola is salty), and place it in the oven, reducing the temperature to 450F. Bake for 15 to 20 minutes, until golden brown. Cool on a wire rack and enjoy! Comments: I went back into kneading-mode for this version, using the KitchenAid instead of stirring with the wooden spoon, and noticed that a longer time of fermentation was better, perhaps because of the rye flour, so leave it for a full hour and check if the dough is bubbly and noticeably risen. If not, leave it for another 15 to 30 minutes. I am submitting this post to Susan’s Yeastspotting. Stop by to see what everyone else is bringing to the party!